Mauritania and Maldives, which both permit citizens who renounce Islam to be sentenced to death, were on Monday elected as vice-presidents of the United Nations Human Rights Council in 2013. In a report detailing persecution and discrimination faced by atheists and humanists around the world, International Humanist and Ethical Union (IHEU), said both countries impose Islam as the sole religion of the state. Mauritania, the report said, outlaws apostasy, or the renunciation of the official religion [Islam] for another or for a philosophy that does not recognize the existence of a deity. Anyone found guilty of the offense is given the opportunity to repent within three days, according to the report. If this is not done, the offender is sentenced to death and his property is confiscated by the state. The report recorded two cases in 2010 in which Maldivians who declared publicly they could not believe in Islam or any other religion were told they would face death if they did not renounce their views. One subsequently declared after special education he accepted Islam and the other committed suicide after writing a note saying he had been foolish to reveal his stance on religion to workmates, the report said. The report said atheists and other religious skeptics [such as Christians and others who don’t believe in Islam] suffer persecution or discrimination in many parts of the world. They can be executed if their beliefs become known in [the Islamic countries of] Afghanistan, Iran, Pakistan, Saudi Arabia and Sudan, as well as Mauritania and Maldives. Egyptian protesters and army soldiers standing guard in front of the presidential palace in Cairo, Egypt, Sunday, Dec. 9, 2012. 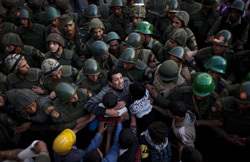 Egypt’s Islamist president has given the army temporary power to arrest civilians during a constitutional referendum he is determined to push through despite the risk of bloodshed between his supporters and opponents accusing him of a power grab. Seven people were killed and hundreds wounded last week in clashes between the Islamist Muslim Brotherhood and their critics besieging President Mohammed Morsi’s presidential palace. Both sides plan mass rallies [today]. The elite Republican Guard has yet to use force to keep protesters away from the palace, which it ringed with tanks, barbed wire and concrete barricades after last week’s violence. Morsi, bruised by calls for his downfall, has rescinded a November 22 decree giving him [almost absolute] powers but is going ahead with a referendum [nationwide vote] on Saturday on a constitution [widely criticized by secularists and other non-Islamists as violating freedoms]. A military source stressed that the measure introduced by a civilian government would have a short shelf-life. “The latest law giving the armed forces the right to arrest anyone involved in illegal actions such as burning buildings or damaging public sites is to ensure security during the referendum only,” the military source said. Presidential spokesman Yasser Ali said the committee overseeing the vote had requested the army’s assistance. “The armed forces will work within a legal framework to secure the referendum and will return (to barracks) as soon as the referendum is over,” Ali said. Northern Mali, plagued by Islamist extremists and gripped by an aid disaster, is “one of the potentially most explosive corners of the world,” the United Nations warned on Monday, as the United States and France differed over how to tackle the crisis. Almost 350,000 Malians have fled their homes, with about 40 percent of those sheltering in neighboring countries, said the United Nations, exacerbating a humanitarian crisis in the Sahel – a belt of drought-stricken land spanning nearly a dozen impoverished countries on the southern rim of the Sahara from the Atlantic Ocean to the Red Sea. Mali descended into chaos in March when soldiers toppled the president, leaving a power vacuum that enabled Tuareg rebels to seize two-thirds of the country. But Islamist extremists, some allied with al Qaeda, have hijacked the revolt. U.N. Secretary-General Ban Ki-moon cautiously recommended last month that the Security Council approve an African Union military operation to take back northern Mali, contingent on political, human rights, training and operational benchmarks being met. France has circulated a draft resolution to approve such a mission, but the United States has countered with a proposal that the operation be split into two missions – one political and one military – that would be mandated separately by the 15-member Security Council, diplomats said. France, which has seven nationals held hostage in the desert region, wants the council to adopt a resolution this month. One senior Security Council diplomat, who spoke on the condition of anonymity, said that the United States was “highly skeptical about the way the French want to go” and have strong doubts about whether a military mission could be successful. b) Why does the election of Mauritania and Maldives to the UN Human Rights Council demonstrate and confirm the utter hypocrisy of the Council? c) Over the years, because of this and other questionable actions by the UN body, the idea has been suggested that the U.S. leave the UN. Out of the 194 member countries of the UN, the U.S. portion of the yearly budget is at least 22% (U.S. taxpayers fund almost one-quarter of the UN’s annual budget). First, think about what you know about the UN: Is it a force for good in the world? Is it fulfilling its purpose? Is it irrelevant? Is it imperative that the U.S. remain a UN member? Then answer the question: Do you support our continued involvement in the UN? Why or why not? b) Why are opponents objecting to a citizens’ vote on the new constitution? b) Why is the U.S. highly skeptical about France’s plan to back an African Union military operation to take back northern Mali from Islamic extremists (al Qaeda)? According to human rights groups, the U.N.’s Human Rights Council is controlled by a bloc of Islamic and African states, backed by China, Cuba and Russia, who protect each other from criticism. UN Secretary General Ban Ki Moon and former High Commissioner for Human Rights Mary Robinson have criticized the council for acting according to political considerations as opposed to human rights. Islamists have urged their followers to turn out “in millions” the same day in a show of support for the president and for a referendum they feel sure of winning with their loyal base and perhaps with the votes of Egyptians weary of turmoil. Instead it is contesting the legitimacy of the vote and of the whole process by which the constitution was drafted in an Islamist-led assembly from which their representatives withdrew. The Islamists’ efforts to impose Sharia law has also extended to banning ring tones on mobile phones that are not Koranic verse readings, as well as prohibiting cigarettes and alcohol. Women who wear jewelery or perfume, or fail to cover their heads can also face punishment, Human Rights Watch said in its report on Sept. 25. ECOWAS [The Economic Community Of West African States] has agreed to commit the 3,300 troops for an international force in Mali. The troops would mostly come from Nigeria, Niger and Burkina Faso, but other West African countries and two or three non-African states may also contribute, Ivory Coast President Alassane Outtara has said. U.S. ambassador to the United Nations, Susan Rice, told the council that the world body must be careful to address the crisis in Mali without destabilizing the entire Sahel region. Ban’s special envoy for the Sahel, former Italian Prime Minister Romani Prodi and U.N. peacekeeping chief Herve Ladsous have said that any military action in northern Mali was unlikely to happen until September or October next year.